Ever since I came to live here, I have enjoyed watching mom clean out the kitty litter box. Now that she's got this new-fangled Litter-Robot, I don't get much in the way of fun viewing. She makes me sit/stay at the entrance to Patches' private room (oh brother!) and only about every 2 weeks does she have to remove the bag and replace it. What's the fun in that I ask you? No poop to scoop! No luscious smell to take in! Today at All Things Dog Blog she's reviewing the new litter box, along with some new kitty litter Patches seems to like, and she seems quite happy about it all. I just don't get it. Technology is just completely taking all the fun out of a dog's life. I'm going to have to figure out how to send a letter to the robot folks and complain. Us dogs love the smell of a cat litter box and these folks are ruining everything for us. Funny thing is Patches is not complaining. She ought to be; she had to get used to the new contraption. She probably thinks she's climbing into a spaceship every time nature calls. Poor girl. One of these days I'll figure out why she seems to like it and report back. For now, things are looking pretty glum for us dogs. 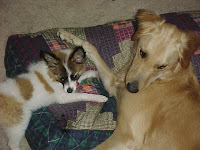 The winner has been announced at All Things Dog Blog, and mom has made us take an oath of office. 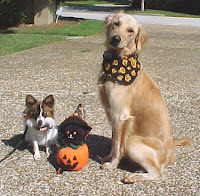 She made us 'lawmen', in charge of protecting the Halloween Treat Prize for her winner. After that, she dressed us up in Angel Wings and we had to completely change our attitudes. Boy was that confusing. First she tells us to be tough and macho; then we have to be sweet and Angelic. Do you want to see our pictures as Angels? 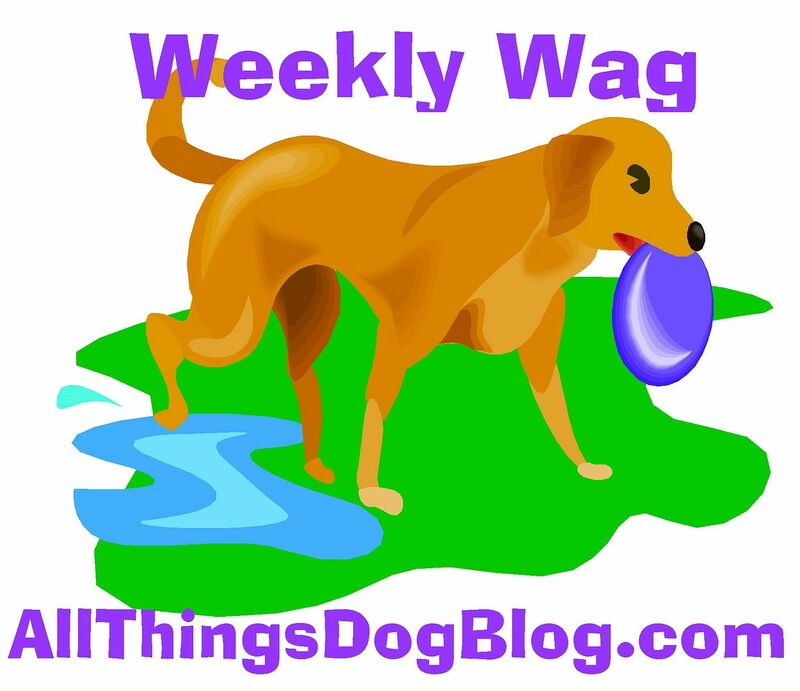 Check us out at All Things Dog Blog. We tried to be as sweet as possible. Maybe if we could have had some candy we would have been sweeter. Too late now. Oh well; such is the life of an All Things Dog Blog dog. We're not complaining; we got treats for doing all the photos. Mom got to try out two new toys today, and we're helping. She got a new Tshirt from the folks at Freaky Dog People, just in time for Halloween. I don't have the heart to tell her she doesn't look very scary, but then my costume is pretty much for softies too. At least we'll both look cute! That reminds me...have you entered the Halloween photo contest? There's a big bag of treats for the winner, so don't miss out on this. Mom put lots of our favorites in the bag. Somepuppy will be very lucky on Friday! If you want to see Mom's review of the Tshirts, you can check out her article at All Things Dog Blog. She's giving 3 shirts away next week, and all the instructions for entering the drawing are there. Yeah for FREE! She's been learning to use her new camera, so today we tested the timer feature. How cool is that? She gets credit for the picture and gets to be in it with me too! Technology is so much fun. I better get back to work. Mom just put me in charge of keeping Tanner occupied, so I've got a big job to do...catch ya later! 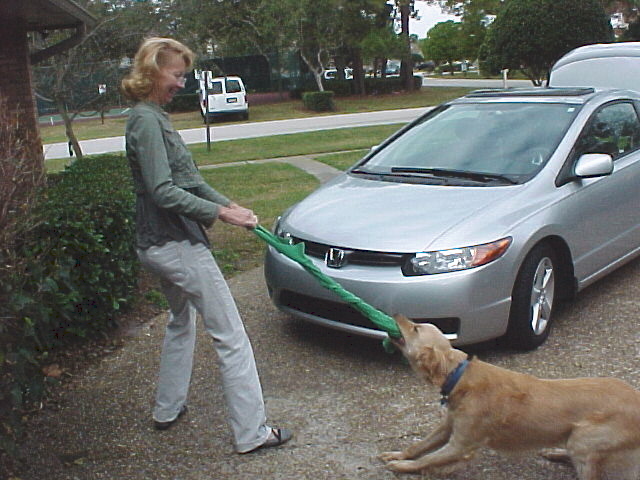 Mom and I are tugging for a trip to Big Lots. She told her readers over at All Things Dog Blog that they have all the AKC treats at special pricing. A little help here....c'mon you guys. I gotta win this tug game to get to Big Lots and stock up on yummies. Trust me; Oliver is NO HELP. Ugh. No More Cat Litter Raids? This whole Be the Pack Leader business is just getting out of hand. Mom trained Oliver and I to stay out of the cat's 'room', and now the investigative fun has ended. What good is a pup's curiosity if he can't use it? The closest I can get is about 4 feet from the new Litter-Robot, and it has this tiny opening, so I can hardly get my head in to make a steal, even if I am lucky enough to get into the room when Mom's not looking. On top of that, she had to go and put this nice-smelling litter in it that's made out of corn. She says it's the World's Best Cat Litter. It sure does smell better than the old-fashioned clay stuff. Any ideas on how I can get the goods? 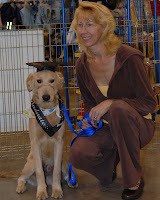 I'm gong to have to find a way to stop mom from reading training manuals and taking training classes. I just want to visit the dog park, eat and swim. Okay, so I do want a fetch game in there somewhere too. But respecting the cat is way too much to ask. Well trained dogs unite; we need a plan! Mom is conspiring with the cat litter company and the Litter-Robot folks to give away prizes. That means more owners will be trying to train their dogs to respect their cats. You guys better get on board and let's come up with a plan, before too many more folks enter her drawing at All Things Dog Blog. Leave your comments here and we'll work on it. This week has been a bit tough for us. 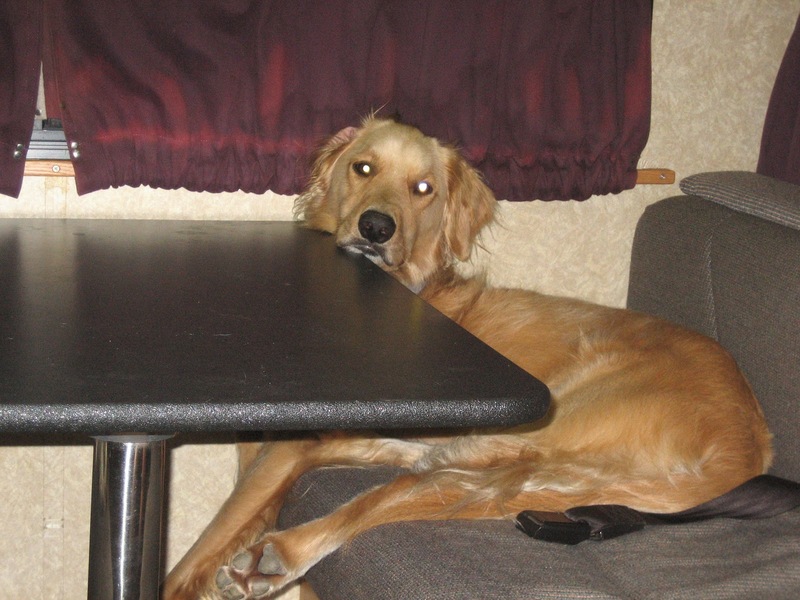 Missing our Xena, the Editor-in-Chief of this blog, we're pulling all the weight. Mourning a packmate is normal for dogs, so I guess we're not behaving terribly out of the ordinary. We just haven't been the perkiest pups in the park, but we're working at it. Mom has had us out for lots of walks, swims and dog park visits. 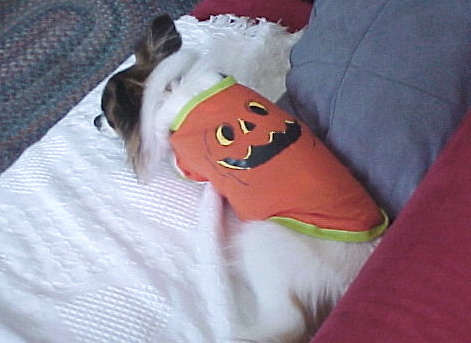 She even dressed me up in last year's Halloween costume to see if I'd liven up, but instead I took another nap. The socializing at the dog park was probably the best thing for us--helped get our minds off things at home. "One paw in front of the other"
If you have ideas for helping us cheer up, we'd love to hear them. We can use all the help we can get. The comment link is down at the bottom. Feel free to offer your tips. Thanks! Mom just can't seem to stop with this Woof and Meow stuff. Her latest post has all sorts of ideas for keeping us dogs out of the cat area. It's really no fun and I personally do not think it is fair. Checking out Patches' bowl and sniffing her litter box are on my daily To Do list. Unfortunately, now that she has all these "tools" and we've been put through the paces in her training program, the fun is over. No more investigations of Patches 'room'. Anybody got any ideas? This is a serious call for help, here! I did come up with one idea. With Halloween coming up, I thought I'd dress up Oliver as a cat so he can sneak in. He's small enough, and I can push a box in there so he can jump over the gate. "How will he get back out?" Oh! Houston; we have a problem. I'll have to get back to you on that. My friends over at A New Beginning are in tough position. They were granted possession of over 250 Labs and Lab mixes that needs foster families and forever homes really fast. These are nice folks and Labs are nice dogs. 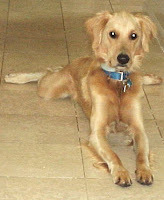 I oughta know; I'm a Retriever too. That makes us sorta relatives--cousins, I guess. If you can help with a donation, food, an adoption, or perhaps by fostering a dog for a while, they would be very thankful for your help. Visit the link above to learn more, or visit All Things Dog Blog. 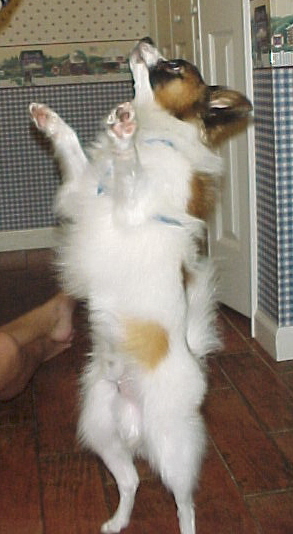 Tanner is making a fool of himself, chasing that silly blue ball all over the house. It jumps, changes directions and circles at will, assuring that he never quite knows what it will do next. Mom winked at me when she gave it to him, and she's gotten a good laugh out of his confusion. Soon he'll be flat on the floor, too pooped to worry with the goofy toy any longer. Maybe Mom will give it to Oliver next? I have to admit it is keeping him quite well occupied. I think that was her goal. Afterwards, she'll retreat with her camera, to the computer to write about his silliness. Poor Tanner! I guess it will be his turn to be embarrassed, since he hasn't managed to control the jumpy, wiggly ball. Better him than me! I'm totally bummed. It seems mom is out to take away all our fun. First she put in a cat door to keep me out of the cat's room. Then she trained me to stay in the hallway and not enter, even when the door is open. Now I hear she has even got a new cat box that I won't be able to raid; it has a tiny entry that big 'ole me won't fit through. I really need your help. Can you check out this new contraption over at All Things Dog Blog and let me in on any secrets that might help. Pleeeeeze! Oh well; I had a nice party today to celebrate my birthday tomorrow. Tanner and I called it Yappy Hour! LOL Xena joined in for a few nibbles and headed back to her nap. It's a senior citizen thing, I guess. Tanner and I also celebrated with a romp at the dog park, something we never turn down. I met a bunch of new friends and they all asked about the "cookie" smell on us. The yummies from Bone Appetit were a special treat, for sure. We're looking forward to doing some serious shopping there real soon. Let's see....maybe Halloween treats? Note to self: Get a calendar and mark the shopping dates. 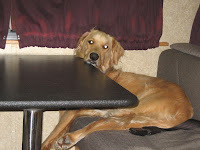 Check out my birthday pics at mom's post on All Things Dog Blog. I also got my trading card pic posted at Toki Poki; I love my card! Oh, and Mom even got me a birthday hat with fuzzy stuff on it...kinda babyish, but we still had a good time. G'nite! Dogs in Mourning. How Will We Manage When it is Our Turn? Not to be morbid or anything, but Dr. Pat's post on All Things Dog Blog today got us to thinking. Our packmate, Xena, is getting on in years. We see it in her gray muzzle, her slower walking pace, and her longer naps. Mom even gives her a few chances to break the rules here and there, probably cuz she's just getting older. She's been talking with Dr. Pat about these things, and it's hard to ignore the facts. Mom tells us that everything will be okay, no matter what happens, because she will always be there for us--to be strong, keep us active, and keep our minds busy. She says that's the trick--keeping us busy until we get through it. In a roundabout way, that's sorta what Dr. Pat says too. For now, Xena is still a happy girl, even though she is slower. We enjoy her even as she barks louder because her ears are not so good, and when she has trouble finding the right spot outside at night, because her eyes don't work like they used to. As mom often says to Xena, "It's okay, Xena. Take your time. That's what retirement is all about--slowing down and enjoy your rocking chair days." Let's face it. Some of us were created to chase smaller creatures. Me? I'm a duck-kind-of-guy. Yup! 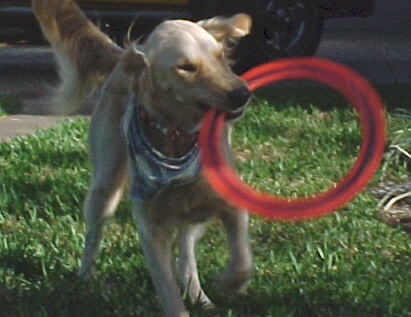 Golden Retrievers are supposed to go fetch the duck after the hunter shoots it. Me and my mom aren't much into shooting, even though I do think ducks are really cool. We play fetch with all sorts of other toys though. 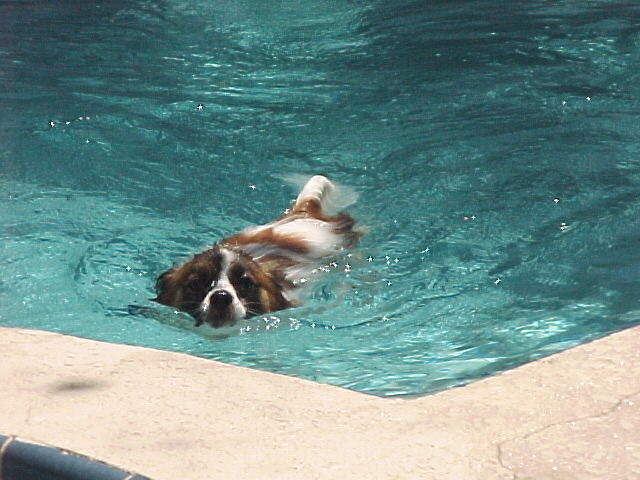 My favorite part is playing it in the pool; I love to swim after the toys and bring them back to her. You can learn how too, here. But I digress; this was supposed to be about cats. Back to smaller creatures. Cats get us dogs' attention by being stealth. They sneak around the room, acting like we probably don't see them, and then suddenly dart across a piece of furniture. That's where the trouble comes in. I had to teach Patches that myself. Even mom didn't quite get it. Once Patches realized that I would remain calm around her, as long as she was calm around me, we began to become quite friendly with one another. Now we sniff each other every day (it's a greeting thing) and make sure we're always sociable. That's good, cuz I get my feelings hurt whenever anybody--furry or not--refuses to greet me. 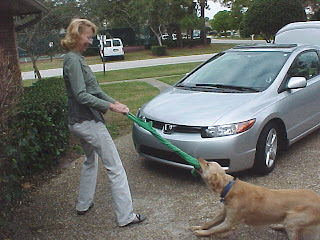 Mom's working real hard on a series of articles to help dogs and cats with this problem. Keep an eye out for the rest of her series. Here's her intro. Funny title, but I guess it gets the message across. One last thing. Apparently mom has some really cool cat gifts ready for the winners of a drawing at the end of her series. She's really excited--giddy--so I guess this is cool cat stuff. Tuna, maybe? Okay, guys, I swam to the shallow step....all the way across the whole pool. Did I mention we have a lap pool; it's very long! Now I need a good, calming nap. I've got just the thing...Lisa Spector's music, called Through a Dog's Ear. My mom got her selection from Lisa, and we really enjoy napping with it. It has become mom's favorite weapon for making sure we calm down after an activity, and enjoy a peaceful, relaxing nap while she works. 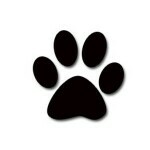 The winner of today's drawing at All Things Dog Blog is Dawn, from Pet Auto Safety. She'll be getting a sample CD from Lisa that will get her and her pups started on the relaxation roadway--sounds good for a lady who is into pet auto safety, huh? If you'd like the CD set, including the book, check this out. There are others as well. Enjoy! What's next? I will be doing the Hoki Poki, dancing for you guys next week, so don't miss it. I'll also be giving away Tshirts and trading card packages from Toki Poki, so don't miss it. Want to know how you can get in on the prize drawing? Check this out. P.S. I think there will be more than one prize, and shhhhh.....you can enter as often as you like. Have fun!